For patients who have lost an arm, or a portion thereof, being fitted with a new prosthesis can be an expensive, time-consuming, and labor-intensive process. Before receiving a permanent prosthetic arm, patients are fitted with a temporary device to ensure correct size and fit. Each fitting can take three technicians as much as four hours to craft, and there’s no room for adjustment; if they make an error, they must start from scratch. 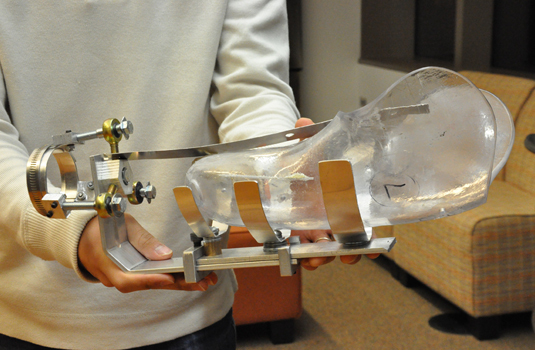 This fall undergraduates in McCormick’s Design Thinking and Communication course were given a challenge: to develop a new temporary fitting solution to connect the patient’s residual limb to a prosthetic terminal device that can emulate the functions of the human hand. The new device must require less time to customize than current methods, use less expensive materials, allow for adjustments, and allow for reuse from patient to patient. Required of all McCormick freshmen, Design Thinking and Communication (formerly Engineering Design and Communication) is a two-quarter, foundational course that teaches a special kind of problem solving for the design world and the communication skills needed to achieve it. In many business and academic circles, this process is known as “design thinking”: frame a problem, consider solutions, refine, and execute. The process beings with an understanding of the design problem. After talking to patients and their clinician-clients at the Rehabilitation Institute of Chicago, the students understood the stakes for the temporary prosthetic device were high. “Imagine if one arm is one inch longer than another, or if the wrist angle is slightly off — you wouldn’t be able to feed yourself,” said Evan Rosati, one of the students in the course. Over the course of the quarter the students — many of whom were undertaking their first-ever design project — spent long hours conducting background research, interviewing experts, sketching their ideas, and working on their calculations and prototypes. The complex assignment required students to work within a number of constraints to create an adjustable, customizable, and cost-effective model that could fit with other manufacturers’ permanent fittings, said David Gatchell, clinical associate professor in the Segal Design Institute and one of the course’s instructors. 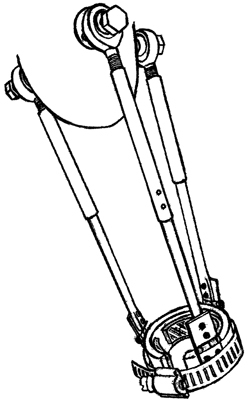 The students created three prototypes: CAREFit, a design that featured two threaded telescoping aluminum tubes and two nested hemisphere-shaped wrist attachments; Triumph, a fitting that could be installed in 40 minutes, adjusted in 5 minutes, and could support 30 pounds of weight; and Pro-ARM, which featured sliding aluminum plates to allow for maximum length adjustability and a unique combination of ball joints, threaded aluminum blocks, and spring steel connectors to provide the required adjustability at the wrist. In the process they worked to hone their communication skills, gearing up for a final presentation to clients and judges. That required more than just practice with public speaking, but learning how to best frame their work: What’s the best way to discuss a device’s shortcomings? What can I do to quit fidgeting during my presentation? The results were successful, said Kathleen Carmichael, a lecturer in Northwestern’s Weinberg College of Arts and Sciences Writing Program, whose faculty co-teaches Design Thinking and Communication. 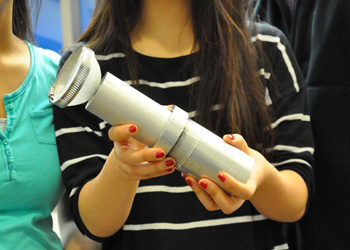 While the students’ projects show promise, they require further testing as the client works toward a usable design. Meanwhile, in the second quarter of Design Thinking and Communication, the students will address a variety of problems from health care, industry, and education.